Should've rewarded something less uninteresting than gold. From the other wowhead page on the bounty quests:"Missions: Completing a bounty quest unlocks the equivalent "Wanted" mission for your followers. These missions require 3 level 100 followers, have 3 threats, and take 8 hours." The follower mission that showed up for me after killing this guy gives 20000 BASE experience (meaning your followers get all of that whether you succeed or fail) as well as a follower trait retraining guide if it succeeds. 1 - Back up a bit when he submerges so that you're not in the middle of the adds. You can get away with killing only a few, and the rest will run off soon after you grab a net. Make sure you do kill at least one big add, though, so that you do get a net. 2 - You can use one net more than once. If you wait until he is about to submerge, you can probably get away with using only one net the entire encounter. 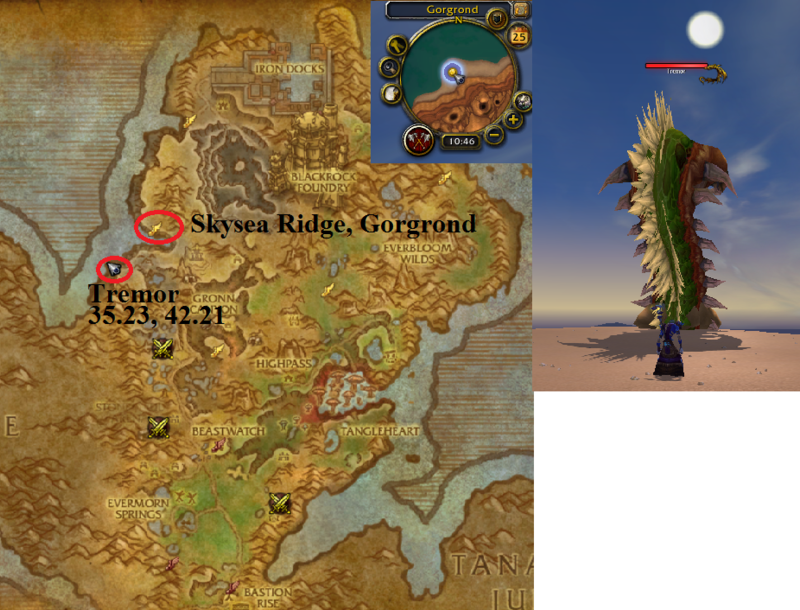 If your Gorgrond is lagging like Stormrage was today, though, you'll want to use it preemptively. The adds are far deadlier than the boss, after all. 3 - If you use Defender Illona, you might actually want to dismiss her for this. She kept luring all the adds in on me, and getting us both killed. Yet, at the same time, she didn't hold aggro well enough for me to heal us both through killing all the adds. Easily soloable as an Arms Warrior. Used Bloodbath + Ravager when its Adds phase. Net and bash away. Sometimes there can be a bug where you can get the item and hearth back to your Garrison to turn it in, only for the quest to vanish from your log entirely, meaning you have to do the whole thing again. Seu entreposto em Gorgrond está com um grave problema de saberons, comandante, e não podemos continuar enviando tropas para lá. Então eu tive uma ideia. Existe um verme gigante na costa oeste de Gorgrond chamado Tremor, mais conhecido como o devorador de lagostroks. Se você matar o bicho e trouxer a... como posso dizer... a pilha de lagostroks semidigeridos para cá, nós podemos cozinhá-la, mandar para Gorgrond e usá-la para acalmar os saberons por um bom tempo! Que fedor de carniça é esse?! Excelente. Esta carne vai manter as pestes dos saberons ocupados.